Another dark, cold year. The vacation to Kuala Lumpur, Malaysia was wonderful but I had to return to my life in Virginia and to reality. Tired of trusting and caring, afraid of loosing any more pieces of myself, and still hurting from the break-up of over a year ago, I retreated to my den with Gizmo the dog (my best friend), and my bicycle, my best therapy. The Lexapro and counseling were helping quite a bit too. This was one of the best birthdays I'd had in a long time. Normally a birthday is a sorry parade of people you never spoke to before, shaking your hand and giving their condolences, er...uhhh...congratulations...as if I had anything to do with it! I was just hoisted out of the womb by a doctor (yep, a doctor...I'm city folk), spanked a few times, then a few times more, a quick glance at my crotch and they know if I'm Michelle or Michael (I'm very old...like pre-sonagram) introduced to my unconscious mother, wrapped up, and held prisoner for 19 years. I try to keep mum at work but when you are in Air Force Intelligence, they can figure these things out, and the next thing you know there is a flaming cake, a room full of people singing to you, and it's not your favorite song (I like John Denver). So I've gotten smarter now...the Air Force has a tradition of giving people the day off, duty-permitting, on their birthday. So just ask your boss, tell him (only him) it's your birthday, and by the time the rest of them find out you're gone, it's too late! They're in a room singing, the cake catches fire, the building burns down which brings me to a warning I made earlier...cake doesn't pay!!! Meanwhile in Horsey World, I'm speeding off to the Blue Ridge Parkway...there are mountains to climb. 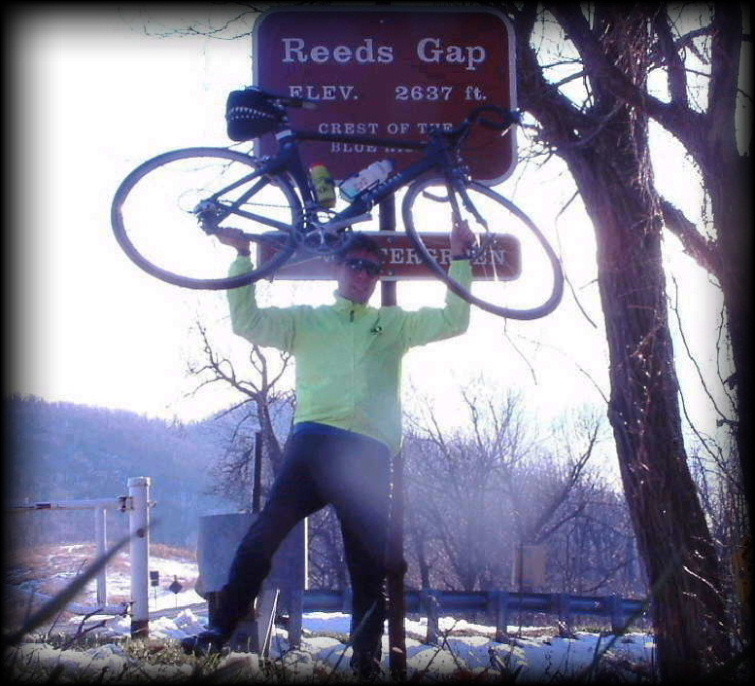 And so I tackled my achilles heel, Reeds Gap . 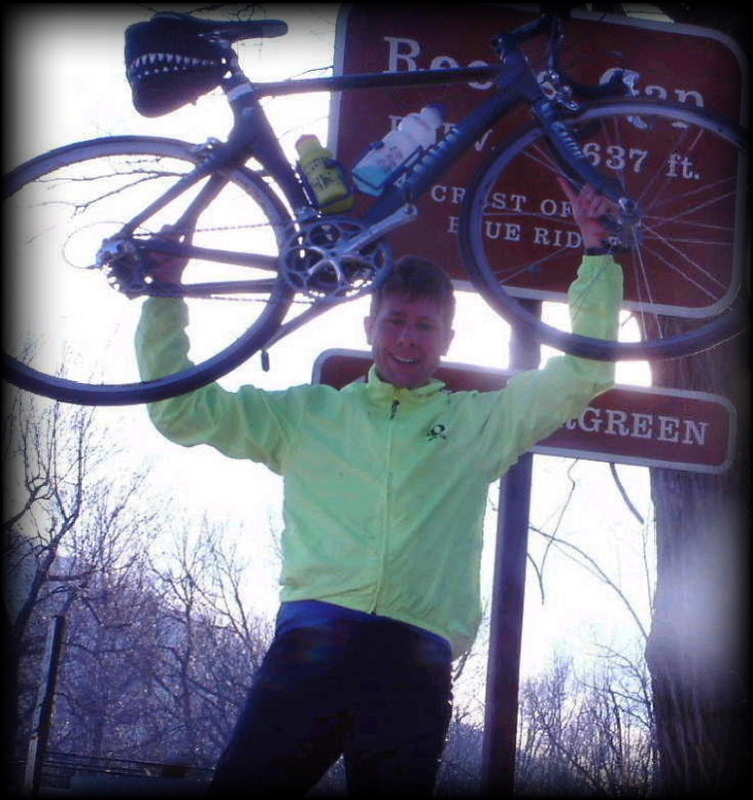 After having failed to beat it five times before, riding in freezing temperatures, slipping on patches of gravel, water, and snow, I rode this monster climb non-stop to the top and finally prevailed on my 38th birthday, doing a Mount Evans-like bicycle salute for this photo. Unfortunately the climb, very steep (sections of 20% grade), was too dangerous to ride down in these conditions. 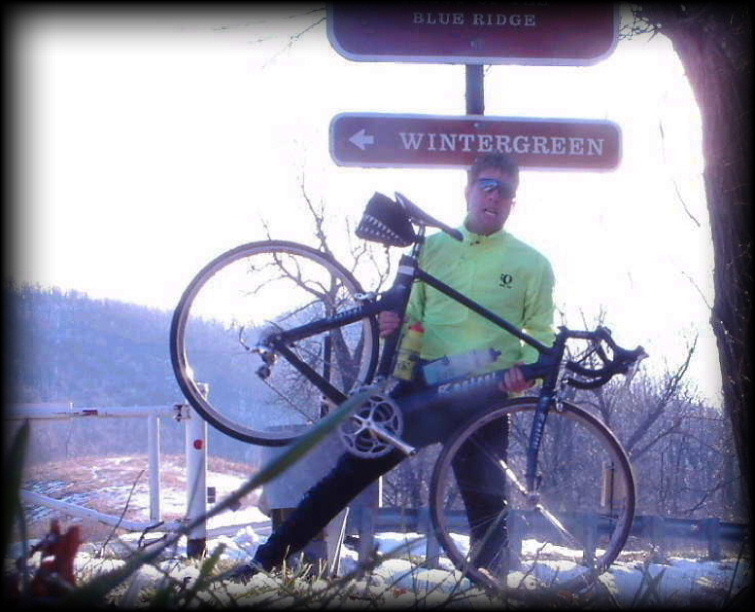 The Blue Ridge Parkway was closed due to snow, and so I had to walk my bicycle down the top third of the seven-mile climb. The peace and beauty of the mountains are always refreshing, contrasting Hampton Roads, and are a source of hope...along with the sun illuminating God's artwork that really screwed up this shot!!! It was a rare, moving experience which made me thankful I was alive and had this moment alone with my creator. Somehow all the pain of 2003 was under me as I revelled in the simple joy of climbing a mountain and being just a little closer to touching God. I was cleansed. One bit of advice...if dexterity isn't important to you, a pillar of snow makes a fine tripod in a pinch. Finding something to hold up a bicycle is a little more complicated.